Once upon a time … there lived a young king who, not caring for State affairs, took refuge in a fairy-tale world. All fairy tales have a happy ending, but that was not the destiny of King Ludwig II of Bavaria, who was deposed from the throne and who died untimely at the age of 41 without making all his dreams become true. Was it suicide, accident, or homicide? The answer will probably remain an unsolved mystery. However, the lunatic king as he was called by his own subjects, bequeathed a very precious heredity to Bavaria before dying. He had three wonderful castles built which have made visitors dream for over a hundred years. They are called: Neuschwanstein, Linderhof and Herrenchiemsee. The trip starts visiting the Castle of Hohenschwangau, the residence of Ludwig II’s parents: Maximilian II and the princess Marien of Prussia. In the rooms of this yellow-ochre building you can admire ornaments, paintings and other valuable objects testifying the history of Bavarian dynasty. Young Ludwig spent his childhood and adolescence in the big rooms of this residence until he was 18, and he was crowned king. His bedroom is worth a visit as it is richly decorated with frescoes representing the story of Tristan and Isolde. As the dark-blue ceiling is starry you can foresee the very romantic personality of the young king and you can presume that that was the initial source of his aspiration: to build a castle not far from Hohenschwangau. His desire became true when in 1869 He started building Neuschwanstein castle, which stands on top of a rocky promontory, imbedded in a forest of tall fir trees, and in a splendid mountainous landscape. It looks like a fairy-tale sight. Both the exterior with the high towers and the inside halls look more like a backdrop than a dwelling place. However, as and ironic destiny, King Ludwig II lived there only 102 running days and the building remained unfinished. In Neuschwanstein castle you can breathe a more romantic and fairy atmosphere than in Hohenschwangau, Ludwig’s parents. The furniture is breathtaking, inspired by Wagner’s most famous operas. You are really struck when you enter the Throne Hall after the Byzantine style, the bedroom with wooden finally engraved pillars and a rich canopy, the hand made grotto and a tiny winter garden with a view onto the plain. From hall to hall you get to the Singers’ Hall, used only after Ludwig’s death. The visit to the castle ends on the ground floor where there is the broad kitchen, which was ultramodern for the time when it was built. Actually, it was endowed with all the most recent plumbing services: cold and warm running water, an oven and an automatic spit. Within a walking distance, there stands Marienbrücke bridge, a gangway 92 meters from the ground. Ludwig II adored to stay here at night looking at his lit castle, illuminated with thousands of candles. Today you can enjoy a superb view over the surrounding landscape and over the picturesque lakes all around the town of Füssen. You can also have a better sight of the castle itself. Not far from Ettal there stands Linderhof Castle, the only one which is completed and where Ludwig II lived for a certain time. The building is like a daydream. It is a gaudy triumph of Baroque and Rococo, a homage paid to Versailles that had greatly impressed Ludwig II during his stay in Paris. On the four corners of the castle there are 4 jutting round little rooms painted pastel, a passage between one part and another of the dwelling place. 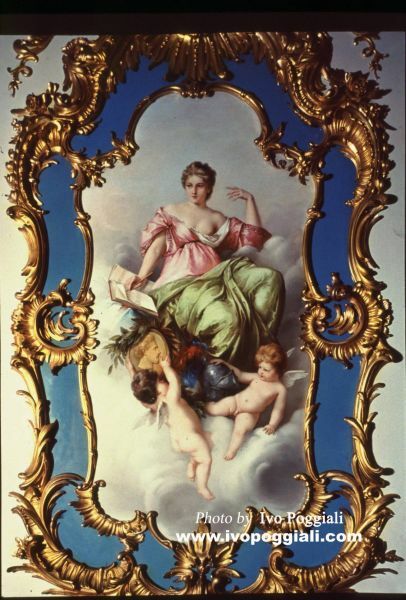 The most impressive room is the bedroom where an imposing pillared bed is covered and surrounded with a Prussian blue canopy. 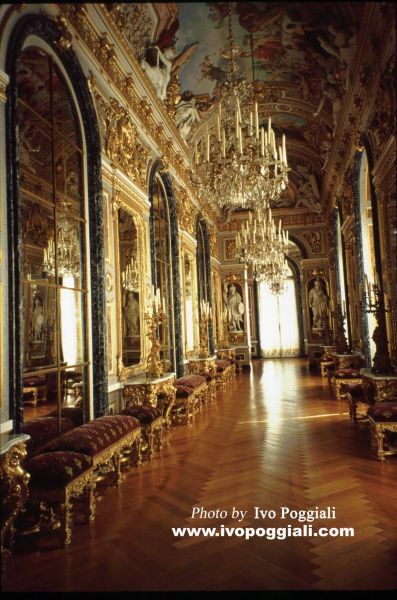 All the rooms are decorated with scenes of Louis XIV of France’s life. Ludwig II felt deeply envious of the French king because of the latter’s enormous power, power which the Bavarian king understood he would never have in his country. 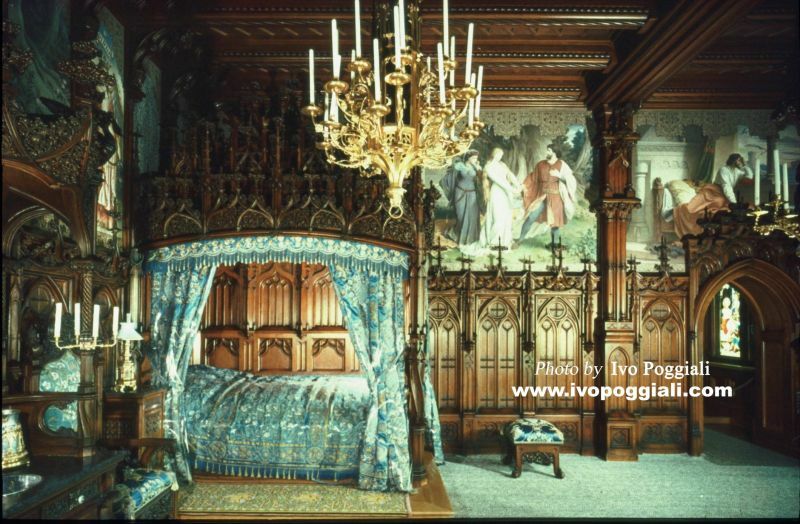 A guest room can also be seen in Linderhof castle ready to host Richard Wagner, his own friend. The room is very accurately furnished and a long piano stand in the centre for the great musician to play. However, Wagner never visited Ludwig II’s castle in spite of the fact that the king sponsored him being a fervent admirer. A tourist visiting the château should not miss to have a walk along the paths of the gardens around the king’s manor. Ludwig II himself adored walking every day in his gardens and admire their lake-lets scattered all over, the golden statues conspicuous amid the green flowerbeds and the large expanse of flowers and ornamental plants. This view makes visitors grasp the king’s will to live in such a fabulous place, a sort of earthly paradise. In Ettal there stands a famous Benedictine Abbey founded in 1330 by Emperor Ludwig the Bavarian. The vast building is eminent for its big Baroque library and its church consisting of a gothic structure, partly rebuilt in the 18th century. The choir stalls and the façade are by Enrico Zuccalli. 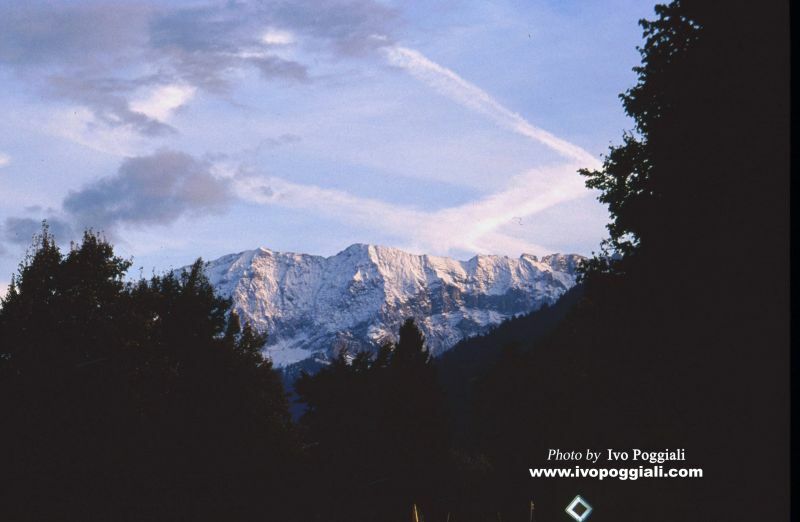 Quite near Ettal and Garmisch-Partenkirchen there is Oberammengau, wellknown all over the world for the local procession called Mysteries of the Passion. It is held every tenth year. The town is surrounded with mountains; a lot of houses are painted in bright colours. Some murals represent scenes from the most famous fairy tales such as Hansel and Gretel and Little Red Riding Hood. It is quite a fun to stroll along narrow streets where nice little figures engraved on wood made by local artisans are sold in tiny workshops. 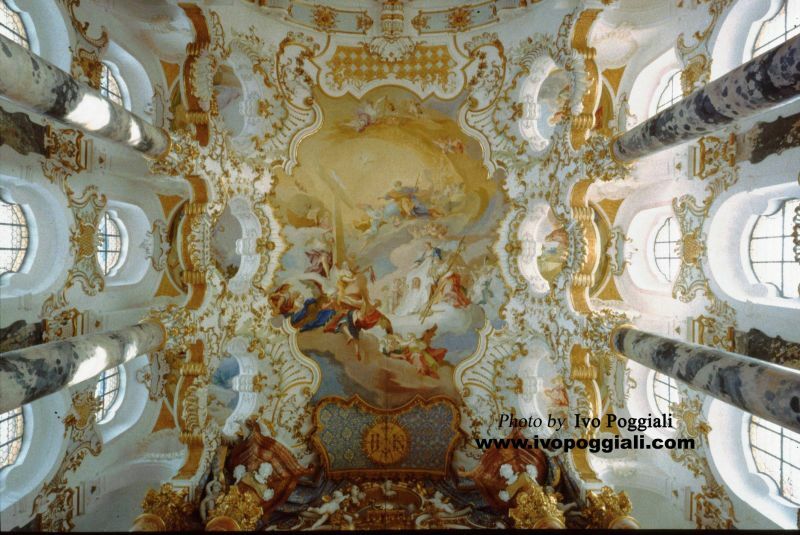 You cannot miss a visit to Wieskirche – the White Church, a real triumph of Baroque Bavarian style which UNESCO has declared Heritage of mankind. Seventy kilometers east of Munich of Bavaria another castle built by Ludwig II appears in front of you: Herrenchiemsee on the island of Chiem lake. You are astonished at its being a real copy of Versailles. The palace was not completed until the necessary funds were collected, but only about 70 rooms were finished. The Staircase Hall, the richly decorated bedroom and the spectacular Mirror Hall are like a miracle of architecture: you really feel lost amid beauty. A story goes that Ludwig had the over 2.300 candles lit every evening to walk along the 75 meters of the Mirror Hall all alone. Last but not least, is the king’s bathroom with a marvelous big red-marble pool. However, the king did not enjoy the magnificence of his Herrenchiemsee castle as he dwelt there only 10 days because of his mysterious death. In the proximity of the castle island there is the Women’s Island called Fraueninsel, a pretty islet on which the Benedictine Convent dating back to 762 A.D. stands like a gift from God. Not only does the convent inspire a sensation of peace and tranquility, but also the fishermen’s picturesque cottages and little gardens hidden in the thick wood do. Enchanted by the many different colors I end my experience in the land of Ludwig II, my eyes full of past, glory and beauty. Unforgettable sojourn spent admiring this unfortunate king’s residences, mirrors of the deep felt worshipping of art and architecture. King Ludwig II was an odd personality, much discussed about in the history of Bavaria, a unhappy sovereign as he used to call himself.